North Korea says it has successfully tested its first "intercontinental ballistic missile" (ICBM). A state television announcement said the missile, which landed in the Sea of Japan on Tuesday, could hit targets anywhere in the world. But the US and Russia said the missile had a medium range and presented no threat to either country. North Korea has increased the frequency of its missile tests, in defiance of a ban by the UN Security Council. China and Russia called on Pyongyang to freeze its missile and nuclear activities. 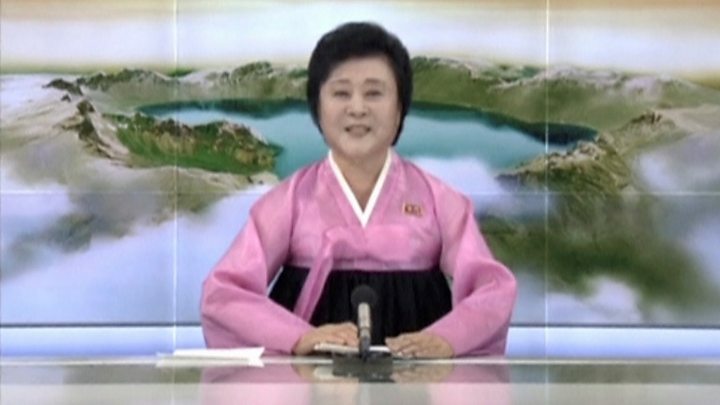 The announcement on North Korea state television said the Hwasong-14 missile test was overseen by leader Kim Jong-un. It would enable the country to "put an end to the US nuclear war threat and blackmail" and defend the Korean peninsula, it said. While Pyongyang appears to have made progress, experts believe North Korea does not have the capability to accurately hit a target with an ICBM, or miniaturise a nuclear warhead that can fit onto such a missile. Other nuclear powers have also cast doubt on North Korea's assessment, with Russia saying the missile only reached an altitude of 535km and flew about 510km. How far could this missile travel? The big question is what range it has, says the BBC's Steven Evans in Seoul. Could it hit the United States? David Wright, a physicist with the US-based Union of Concerned Scientists, says that if the reports are correct, this missile could "reach a maximum range of roughly 6,700km on a standard trajectory". That range would allow it to reach Alaska, but not the large islands of Hawaii or the other 48 US states, he says. It is not just a missile that North Korea would need, our correspondent adds. It must also have the ability to protect a warhead as it re-enters the atmosphere, and it is not clear if North Korea can do that. Once again North Korea has defied the odds and thumbed its nose at the world in a single missile launch. With the test of the Hwasong-14, it has shown that it can likely reach intercontinental ballistic missile ranges including putting Alaska at risk. Kim Jong-un has long expressed his desire for such a test, and to have it on the 4 July holiday in the US is just the icing on his very large cake. Despite this technical achievement, however, it is likely many outside North Korea will continue to be sceptical of North Korea's missile. They will ask for proof of working guidance, re-entry vehicle, and even a nuclear warhead. From a technical perspective, though, their engines have demonstrated ICBM ranges, and this would be the first of several paths North Korea has to an ICBM with even greater range. Are neighbours and nuclear powers concerned? South Korea's President Moon Jae-in has called on the UN Security Council to take steps against North Korea. Japan described "repeated provocations like this are absolutely unacceptable" and Prime Minister Shinzo Abe said his country would "unite strongly" with the US and South Korea to put pressure on Pyongyang. Russia and China said the launch was "unacceptable". Chinese President Xi Jinping is in Moscow, where he held talks with Russian President Vladimir Putin. The two leaders urged Pyongyang to suspend all its tests. They also asked the US and South Korea to not hold joint military exercises. US President Donald Trump also responded swiftly on Tuesday. On his Twitter account he made apparent reference to North Korean leader Kim Jong-un, saying: "Does this guy have anything better to do with his life?" "Hard to believe that South Korea and Japan will put up with this much longer. Perhaps China will put a heavy move on North Korea and end this nonsense once and for all!" President Trump has repeatedly called on China, Pyongyang's closest economic ally, to pressure North Korea to end its nuclear and missile programmes. On the prospect of North Korea being able to strike the US, he tweeted in January: "It won't happen". However experts say it might - within five years or less. Beijing called for "restraint" following the latest test on Tuesday. Foreign ministry spokesman Geng Shuang said China was opposed to North Korea going against clear UN Security Council resolutions on its missile launches. Meanwhile, a spokesman for Prime Minister Theresa May said the UK "stood alongside the US and our allies to confront the threat North Korea poses to international security".